When I see a bunch of mint leaves lying peacefully in the corner shelf of my grocery store, images of sorbet garnished with curly sprigs of mint leaves or a lemonade jar filled with mint leaves and lemon roundels or chilling taste of my mouthwash comes by my mind. The menthol present in it gives the cool and refreshing taste. You can find chopped mint leaves used for garnishing at the end of cooking, it is used in soups, desserts, curries, rice, treat health and skin problems. Mint is native to Mediterranean and Western Asian countries where there are full sun, which helps it grow well. Overcooking can make them taste bitter and always fresh mints are used in salads. Leaves could be dried and stored frozen for its use in winters. There is an interesting story to why mint gets its perfumed smell. It is believed in Greek mythology that once Pluto’s lover angered Pluto’s wife, who in a fit of anger turned her into a small plant. Pluto was unable to undo the spell. To console his love, he gave the plant an aromatic scent and that’s the reason they say that mint has a wonderful sweet smell. I love to hear stories like this, entertaining right? My grandmother is known for sharing these interestingly screen played stories and the memories of those silent nights filled with her voice, me lying on to her right side and D, my cousin on to her other side, nodding to her tales and falling asleep keeps lingering in my heart. Whenever stuck with cold and cough, my achi would say, pluck few leaves from the garden, wash and chew. Yes, mint leaves relieves cold congestion. The leaves can be boiled in the tea too.I generally buy them in bulk and make mint chutney for Indian chaats/sandwich or thogayal (South Indian pestos) or minty lemonades or this simple mint rice from the Ayurvedic vegetarian cookbook – Sukham Ayu. This rice is simple to make and the flavors are incredible. I am so in love with this book, very informative too.The recipe are easy to follow and most of the ingredients can be found in your pantry, so fixing them is like a breeze. Once you read the ayurvedic use of the foods suggested by them, you will get into the groove to cook healthy and importantly, it has made me feel so proud of my heritage. A homecooked Indian meal served by your mom all these years is one of the healthiest way to live. Not knowing that ghee (clarified butter) is good for the health, I blindly used to say no to amma. Even without listening to what she had to say, I would talk back. There will be unpleasantness in the dining table and amma would mumble to herself that ghee lowers body heat and living in a tropical country it is important to have it. Then she would continue one should have the brains to think by herself, if not atleast should listen to elders. That used to be our dinner arguments. Anyways now I have realized the significance of eating our traditional foods and that everything in moderation is perfectly OK. If that still sounds daunting to you, then its time to get your hands and eyes on this award winning health cookbook – Sukham Ayu by Jigyasa Giri and Prathibha Jain. You can read my review here. 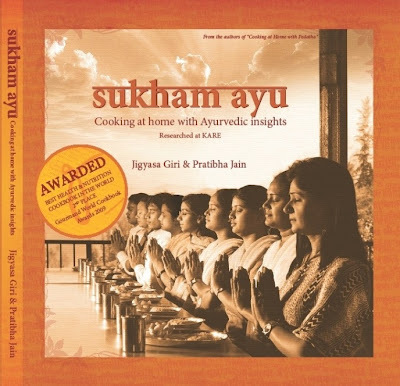 And now for a giveaway you are going to love.Prathibha Jain and Jigyasa Giri are giving away one copy of their Sukham Ayu cookbook to one of my readers. Thank you both for the beautiful gift. Appreciate it from the bottom of my heart! 1. Wash and soak the rice for 10 minutes. Strain and set aside. I soaked mine for 30 minutes. 2. Grind the ingredients of the paste adding little water to form a thick paste. 3. In a pressure pan, heat ghee and add the ingredients of the tempering. When they begin to crackle and let out their aroma, add onions and saute for 3-4 minutes. Add the paste and cook for further 2-3 minutes. 4. Add rice, saute for a minute and add 1.5 cups (if soaked for 30 minutes) or 2 cups water with salt. Pressure cook for 1 whistle or if using a large cooking pan, cook covered in low flame for 15 minutes. 5. Allow steam to settle down and gently fluff the rice with a fork and serve fresh with raita. Serve with vegetarian or any dry non vegetarian curry and raita. This giveaway is open worldwide. To enter, simply do as many of the following as you want and let me know that you did it by leaving a separate comment each time. Please also make sure to leave your contact email for me to reach you if you win. The giveaway will close on September 23rd at midnight, and the winner will be announced shortly after that. Best wishes! 1. Leave a comment telling why you want to win this book. 2. Like Spices and aroma on Facebook, then leave a comment telling me you did or already do. 3. Link to this giveaway on Facebook, then leave a comment telling me and including a link to the post. 4. Subscribe to this blog, then leave a comment telling me you did or already do. 5. Follow Spices and aroma on Twitter, then leave a comment telling me you did or already do and including your Twitter name. 6. Tweet about this giveaway, tagging me @spicesnaroma and linking this giveaway, then leave a comment telling me and including a link to the post. 7. Blog about this giveaway, then leave a comment telling me and including a link to the post. I want…I want to win this cookbook!!! Already like u on FB, Following u on twitter will tweet abt it in a min and will subscribe to it as well. Oh and ur mint rice looks soo comfy. I want to win this cookbook because I love the Ayurvedic way of life and would love to cook from this book!!! Absolutely yummy looking rice… lovely clicks VS.
ooohh! i love cooking & would love to try my hand at some traditional Indian dishes! I would like to win this for my friend's birthday. He has a deep appreciation for the Ayurvedic tradition and staying healthy. I know he'd enjoy this book! I am just learning a bit about indian cooking and would love to have a cookbook that is trusthworthy to guide me through! I like Spices and Aroma on FB. I would like to win the cookbook because I want to learn about Ayurvedic cooking. Flavourful mint rice looks super inviting and yummy..love ur bowl,wonderful giveaway VS.. Seriously tho, have heard great things about it and have a lot of respect for the women founders of this publishing company. Great giveaway Vijitha! The book looks great and I love the sound of your rice. I have never used mint. Not once in my life have I even bought it. After reading your story, I now want to go buy some and use it this week! I would like to second your opinion of this book. It is indeed a wonderful book & Jigyasa & Pratibha have a way of presenting simple recipes with a lot of elan! They are wonderful & warm people as well. I have their earlier book – Cooking with Pedatha… which has also won international awards & is a treasure in itself! Also, I've tasted all the recipes first hand from where this book has been inspired, an ayurvedic retreat near Pune. They are truly simple & delicious recipes. You must try their Beetroot salad, it is too die for. though I'm a fan of this book & recipes, I'm not opting for giveaway as you have put too many conditions.. happy blogging! i love to have this cookbook because i had lot of positive review about this book! am subscriber of your blog too! already like spices n aroma in FB! I did not show much interest in this cook book when it was published but after reading so many reviews on various blogs, I want to own it now. The only reason I was reluctant to buy it was bcz, everyone in my house is a meat lover and wasn't use if I would put this book to good use. Btw, I do own cooking with pedatha and love her traditional recipes. I am hoping to win the cookbook in a giveaway. Yummy and flavourful rice, exciting giveaway too. I am your fan on FB dear, happy to be part of the giveaway. Being a teenager with a passion for cooking, I have tried preparing different cuisines from all round the world. Unfrtunately, I haven't tried a lot of dishes from my own country, India. I would love to get the book and try out some traditional dishes. Have always been wanting to buy this book…great giveaway. Liking you on FB, following on twitter, subscribed via google and tweeted about this giveaway. love to take part too…!